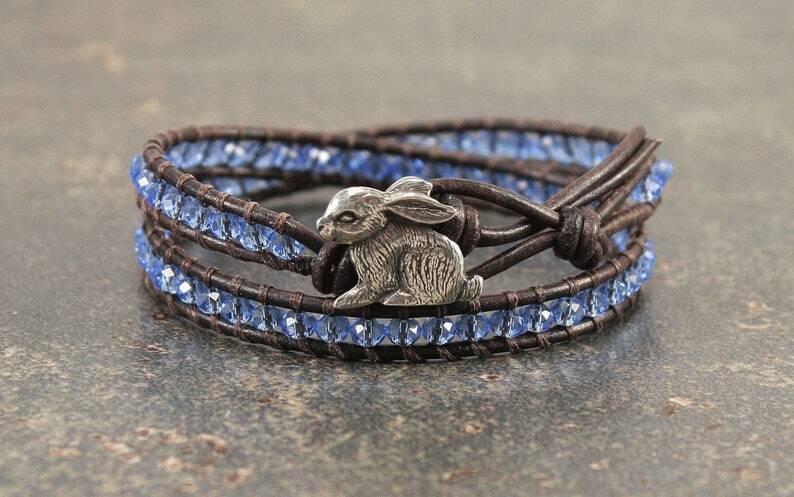 This sparkling bracelet features an artisan pewter bunny button that I've paired with dark brown leather and blue crystals. Each wrap of the bracelet is 1/4 inch (6mm) wide. The bracelet is 14 1/2 inches (38.6cm) long and fits an average 6 1/4 to 6 1/2 inch wrist. Great piece! Quality is good and design wears well! Another fav bracelet. The colors remind me of an old friend an orange and white tabby who I miss everyday. Plus the stones have have a wee bit of sparkle which catches the light for a really cool effect.